Youtube app is one of the most used third party apps out there. The app packs a brilliant design and features that make the experience of watching Youtube videos on iPhone and iPad a delight. While the official app is great there are a few features that are missing from it. A new Cydia tweak called Youtube Pro brings those missing features to Google’s app making it the perfect application iOS users deserve. The tweak also fixes some of the quirks found in the application. For starters Youtube Pro tweak removes those annoying ads enabling you to enjoy your favorite videos in a distraction free environment. It also brings the ‘Music On’ feature, which keeps the background music running even when you open the Youtube application. The sound is only turned off when you play any video. The tweak also allows users to change the video quality settings when they are on the 3G or 4G network. Don’t like Chrome? This tweak can make Youtube app open links in Safari. But that’s not all as you also get the ability to turn on iOS 7’s white keyboard within the app and disable voice search in case you don’t use it. 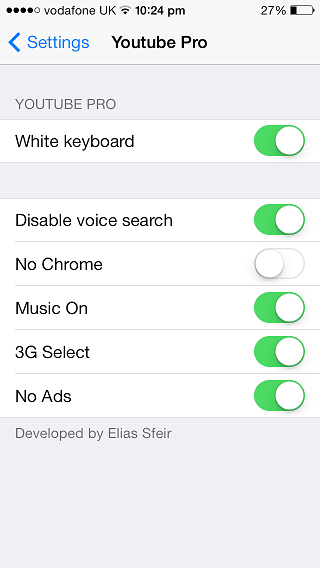 All of its features can be enabled or disabled from the Settings application. Youtube Pro is a nice tweak that adds a number of useful features to the app that is used by almost every iOS user. You know what’s the best thing about this hack is? It’s totally free. You can download it right now from Cydia’s BigBoss repository.